Sharing the Holidays with A Blog Named Hero and all our 2016 Sponsors! The Crafty Nurse here to begin celebrating the holidays and share a special thank you to all of our extremely generous sponsors from this entire last year. Please thank them by continuing to use their wonderful products. I know I will! As I’m sure you’ve heard, the Design Team is “paying it forward” by offering up prizes from our sponsor companies as a thank you to our loyal Blog Hop participants. Please make sure you leave a comment on one of our posts this month and for extra chances to win, enter a card in the challenge. 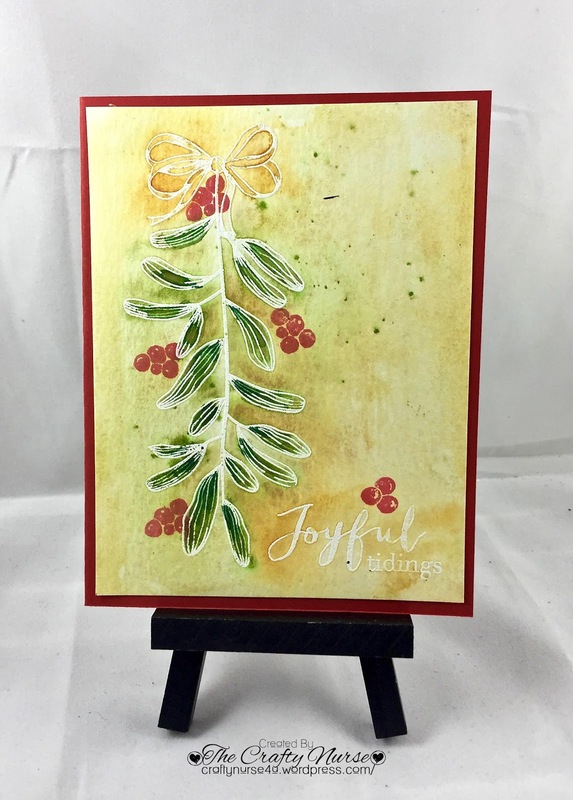 For a little inspiration, I’ve used a beautiful Hero Arts set called, Under the Mistletoe, which I watercolored with Prima and Daniel Smith paints after I white heat embossed. I finished off with some stamped berries using Hero Arts Ombre Ink. Hope this inspires you to grab someone you love and give them a big smooch under the mistletoe! Wow love the background looks perfect behind that lovely mistletoe. I like the wonderful artsy background to this mistletoe card. Oh how pretty! Love the background! Such a beautiful, rich card. Love the coloring. How cool that your mistletoe looks like a Christmas tree. Love the beautiful background!! Looks like a beautiful piece of art!! I love the mistletoe stamp and you knew just what to do with it. It's a lovely card. Love your card! Hero arts is one of my favs! Wow, it looks totally painted by hand… awesome card! I've had my eye on that stamp, but could never make it look like this–stunning! One of the most artistic showcases of mistletoe I've ever seen! I'd be placing this in a frame and hanging it somewhere special as part of my Christmas decor. WOWed! Gorgeous card! Love that beautiful mistletoe design and your fabulous coloring! So pretty! Love the soft watercolored background. Beautiful background for this mistletoe stamp. Very pretty background for your lovely mistletoe sprig ! Beautiful watercoloring – I wish I could watercolor like this! What a great background! The mistletoe looks great over it too! Oh this is beautifully colored. This is simply beautiful! Love your vintage colors! That is a beautiful set and that is a beautiful watercolored card. This is so very elegant! This is such a sweet traditional card design with that mistletoe!